The tenth jubilee edition of the European Fund for the Balkans Fellowship Programme for Government Officials will have its official start on September 1 with the Introductory Seminar in Berlin and Potsdam. 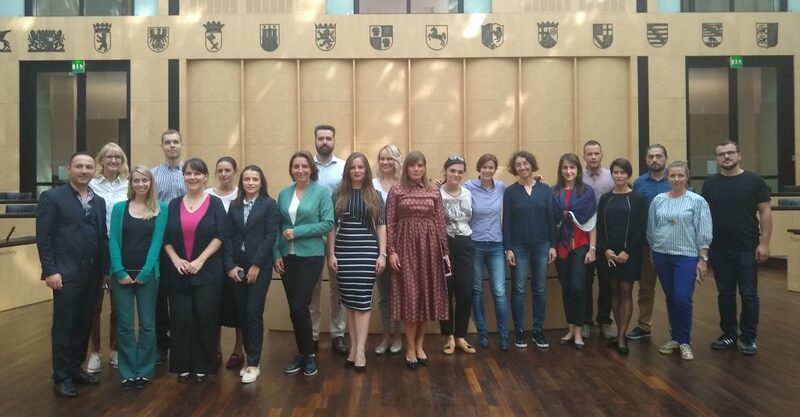 Under the concept of “Supporting Excellence and Leadership in Governance” the programme will once more gather a group of 20 civil servants from the highest ranking state institutions from the Western Balkans. The Fellowship Programme will provide 20 scholarships for civil servants from Albania, Bosnia and Herzegovina, Croatia, Kosovo, Macedonia, Montenegro and Serbia. The Fellows will spend three months in the countries of the European Union, where they will gain work practice in the federal or state government agencies of the host countries, receive tailor-made training through specifically designed seminars and experience national/international and intercultural exchange. The programme will start with the eight-day introductory seminar (September 1-September 9, 2018) in Berlin and Potsdam, Germany that will offer the participants a cutting-edge knowledge of the administrative and political developments and dynamics. The fellows will have the chance to discuss their plans for their fellowship, receive individual advice, present their professional and personal goals and prepare themselves for the fellowship programme. The introductory seminar will serve as a platform for discussion of current political and social challenges and for an exchange of ideas. In conducting the seminar, the European Fund for the Balkans will traditionally combine forces with the “Potsdam Center for Policy and Management” (PCPM) at the University of Potsdam, one of the leading competence centres for governance and the public sector in Germany. PCPM’s contribution to the seminar aims to help the fellows to a “good start” into their fellowship. The Introductory seminar will cover a variety of topics with a focus on public administration and public sector reform and rule of law, and offer various tools to ensure training and learning effectiveness. The seminar days are focused either on skills or knowledge transfer. The knowledge-based part of the programme will review topics in part from the perspective of the seminar’s host country, yet include a level of analysis that aims beyond just the “German case”. Participants will be introduced to complex public management challenges like performance management and public administration reform and to approaches from academia and practice to address them effectively. The skills training sessions in this seminar include presentation skills, employing the Fellows’ individual presentations as “practice cases”. Other workshop sessions will introduce Change Management and Leadership.